May 2018: The beer garden Weyprechthof closed down forever. Der Weyprechthof is located in the Harthof district in north Munich. This restaurant and beer garden has plenty of charm and village character with an obligatory church next door. Wooden carriages and other old-fashioned farming equipment double as large flower buckets in the beer garden. The Weyprechthof offers 650 seats below the canopies of various large trees. The serviced area on a large sun terrace has 300 seats which are tastefully decorated with Bavarian style cotton table cloth and flower arrangements. Fresh Steckerlfisch (grilled fish on a stick) and spare ribs can be fetched straight from the grill at the self service food stall. The Paulaner beer costs €7.60 p/Maß (July 2016). The restaurant building has function rooms for up to 300 guests which can be rented for special events. The regional menu is prepared personally by the Bavarian innkeeper and head chef Gerhard Röttger. 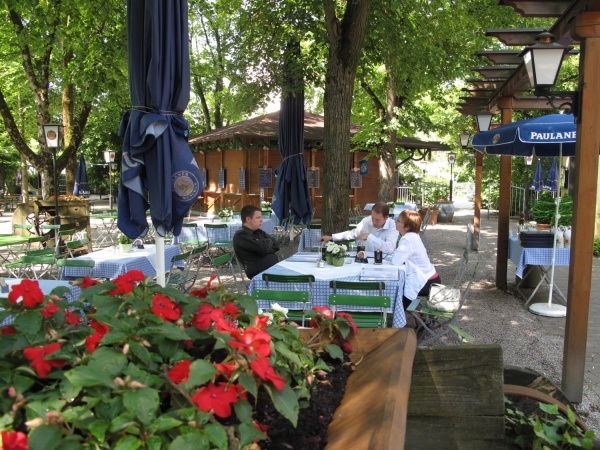 The beer garden is open daily from 4pm to 11pm. The serviced area is open already from 10am. Guests wishing to enjoy a beer in the early morning sun can collect their beer inside the restaurant building from 9am.